Papaya is known for its excellent taste and unique delicate aroma. In Costa Rica and Mexico papaya i’s called the “fruit of good health“. In these countries, this healthful fruit is highly appreciated as a remedy taken to improve digestion. This fruit makes an excellent dietary product for people watching their weight! 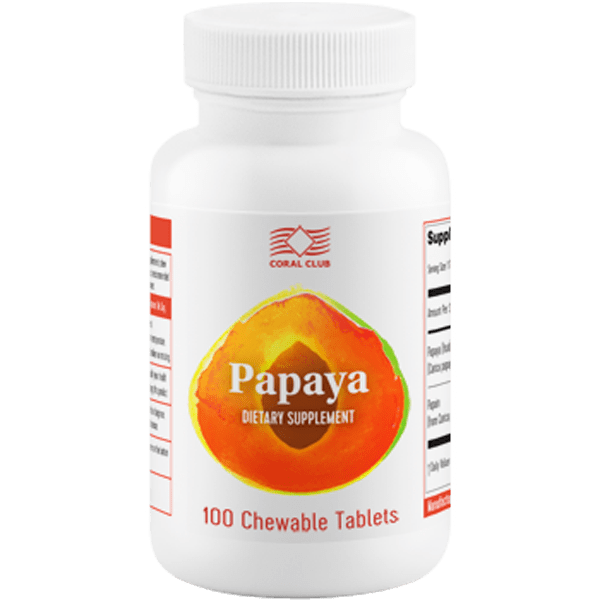 Papaya, a 100% natural product made from the fleshy pulp of papaya fruits, w’s developed in compliance with all the quality standards necessary to preserve nutritional and healing properties of this wonderful tropical fruit. This product is ideal for restoring your vital energy after disease or physical exhaustion. Papaya improves the function of the GIT, cleanses the intestine, and gives a boost of energy and vitality. Re-invigorates the body and brings new energy. This fruit offers a true wealth of useful substances! The pulp contains 6–12% of sugars, up to 1% of protein, 1.4% of acids, vitamins С, В1, and В2, carotene; minerals (potassium, magnesium, and calcium), and enzymes essential for good digestion (papain, peptidase, lipase, etc.). The main substance of papaya is papain, the most important of six enzymes extracted from the papaya juice. The action of papain resembles that of the enzymes produced in the human body, and so it is also known as “vegetable pepsin“. The distinguishing characteristic of papain is that it remains active not only in the acidic conditions, but also in the neutral and alkaline solutions. Papain can substantially improve digestion, especially people experiencing difficulty in digesting proteins; it breaks down proteins into amino acids and facilitates their rapid absorption by the body. Properly assimilated proteins are necessary to heal erosions and ulcers of the mucous membranes, because they are the main building material for new cells. Papain exhibits anti-inflammatory and antithrombotic activity. Papaya is a source of plant lysozyme, which is extracted from the latex of the pawpaw tree. This enzyme is found in plants, animals, and humans and it has antimicrobial and anti-inflammatory properties, because it destroys cellular walls of gram-positive bacteria, fungi, and viruses. Lysozyme also controls immune and metabolic processes and has antioxidative properties. Papaya (Carica Papaya) fruit 30 mg, Papain 3 mg, other ingredients. Take one tablet 3 times a day after each meal. Children love it – like candy. You can safely eat tablets. How to buy a Papaya?